Spending hours in the hot sun at Oaks Amusement Park, waiting in line for the roller coaster or riding the Screaming Eagle is always fun, but can get a little exhausting or overwhelming. The shady tent next to the Dance Pavilion is a comfortable spot to take a break and snack on some curly fries, especially when Dancetastic! is performing. 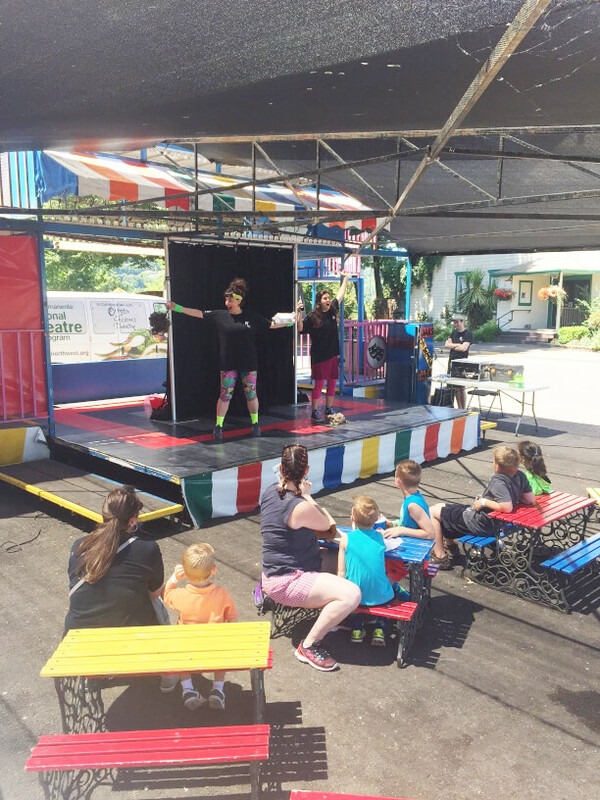 Every Tuesday afternoon for the past two summers, visitors to Oaks Park were treated to a free performance of Dancetastic! presented by Kaiser Permanente’s Educational Theatre Program in collaboration with Oregon Children’s Theatre. This 30-minute-long show ran twice every Tuesday throughout the summer, and served as a great way to take a break AND get free entertainment. On one of those Tuesday afternoons, the audience sat among little colorful picnic tables under the shade of the tent, waiting for the show to begin. Though children made up most of the audience, all ages were represented. The environment was friendly and relaxed, with kids running around and snacking on cotton candy as parents chatted and enjoyed refreshing drinks and the occasional curly fry. Finally, at 2 o’clock on the dot, the first performance of Dancetastic! began. Dancetastic! is a fast-paced, action filled, engaging show that promotes the importance of getting enough exercise and eating a healthy diet. You might expect a show promoting health messages to be cliché, cheesy, and all around boring, but Dancetastic! was anything but boring! The show followed the format of an infomercial, where the upbeat Justin Jive tried to convince Kathy, the show’s exercise-hating host, that his product “DANCETASTIC: DANCE TO YOUR HEALTH” offered a fun-filled new approach to exercise. By interacting with kids in the audience and incorporating their ideas into the show, Justin showed that everyone can find time to exercise by turning daily activities, such as standing in line or preparing food, into DANCE PARTIES! There were opportunities for every young audience member to participate, from showing off their crazy dance moves in a dance battle, to peeling an orange while getting their boogie on! The first moment for audience participation came when Justin asked for a dance move using only your head. Everyone glanced around sheepishly, too shy and unsure to volunteer. Only the bravest kid in the audience jumped up and started doing a head roll. But by the end of the show, every single kid in the audience (and a couple adults) were on their feet in a conga line together, hands on each other’s shoulders. The show culminated in an amazing dance battle, with one half of the audience competing against the other half. The whole tent was full of creative dance moves, as everyone from toddlers to grandparents shook their groove thing to bring their team to victory. Not only were kids excited to get up and exercise through dance, but they were also able to dance together, in a group of people they have never met. By the end of the show, three kids in the audience snacked on the oranges they won from the orange peeling dance contest, offsetting the cotton candy eating kids around them. This demonstrated the Educational Theatre Program’s mission of “inspiring people to make healthy choices and build strong communities.” Hopefully the kids will carry the joy of eating healthy and yummy foods as well as dancing and exercising with others after the show is over. Emily Newton, a member of the Education Theatre Program, originally came up with the idea for Dancetastic! In order to make exercise “fun, engaging, and easier.” Dancetastic! premiered last summer, and Emily, along with Dancetastic! performer Jeff Desautels, rewrote the show to include more action and less dialogue for a more fast-paced, action-filled time. Folks may not come to Oaks Park intending to see theater, but, having experienced Dancetastic! myself, it proved a great way to refuel, have a laugh, and remember that sometimes you just need to shake and shimmy it out! Heidi Osaki is a senior at Grant High School and a 5th year Young Professional at Oregon Children's Theatre. She is so excited to combine her interests in writing and theater through blogging for OCT and Kaiser's amazing Educational Theatre Program.